The Cathedral said it had made the decision “with the greatest reluctance” and reiterated that it “shares” the message of the protesters and wants to see the message “debated and acted upon”. It will also be praying for the protesters in today’s service, the first since the cathedral reopened. A Corporation spokesman had earlier claimed that the protesters were “damaging the integrity of their protest by their actions.” Eh? Surely it’s the Corporation’s own integrity that’s being damaged through its actions? 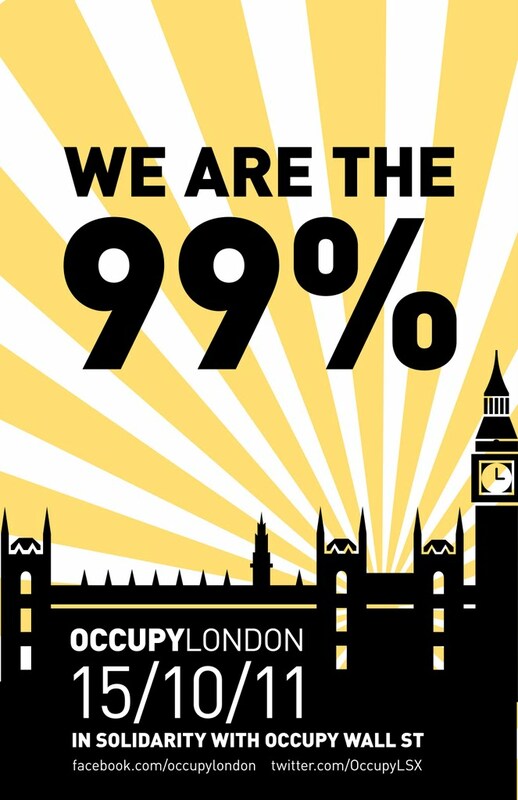 Occupy LSX is expected to release a statement soon with a list of demands for the democratisation of the City of London. The demands include an end to secrecy and tax evasion among the City’s financial institutions. No-one can object to that, can they? Occupy also wants to see a reduction in the powers of the “unconstitutional” Corporation, which apparently has its own judicial system and police force. I never knew that – no wonder the Corporation is getting edgy; it would probably rather that little snippet of information wasn’t widely known. What’s more surprising, and disappointing, is the Church’s decision to join in the legal action. Given its stated sympathy with the aims of the protesters, I wonder who’s pulling the strings there? Someone is being leaned on rather heavily by commercial interests, one would imagine. The whole episode of the closure of the Cathedral smacked of a set-up anyway: the initial claims that it was for “health and safety” reasons concerning the use of portable heaters by the campers, and access issues, were later contradicted by the fire service, which denied having recommended closure of the cathedral. The protesters have never tried to obstruct the entrance to the church and indeed some of them have said they were among those worshippers at today’s service. One individual from the Church has come out of this with integrity. Hero of the week is The Reverend Canon Dr Giles Fraser, Chancellor of St Paul’s, who resigned yesterday. The brief statement announcing his departure revealed nothing about the reasons, though Fraser, who has been publicly supportive of the Occupy movement and has developed good relationships with the protesters, has been quoted as saying he was unhappy at the plans to evict them, saying he couldn’t square such behaviour with his conscience. Meanwhile, as the prospect nears of police being called on to enforce the legal action, the behaviour of the American police in dealing with their own Occupy protests is a worrying trend. The case of US marine Scott Olsen, who was this week hit by a tear gas canister fired into the crowd by police at the Occupy Oakland demo in California, has made headlines around the world. Olsen’s skull was fractured in the assault http://yfrog.com/gz74wuxj and the mayor and local police chiefs have apologised, according to the San Francisco Chronicle http://www.sfgate.com/cgi-bin/article.cgi?f=/c/a/2011/10/27/BAD61LN3LM.DTL. Today, I watched the live video stream from San Diego (@occupysd), where lines of armed police moved in to the peaceful occupation, silently and intimidatingly pushing the occupiers back to clear the street. The scene was being filmed by a video cameraman and streamed around the world. It was fascinating to watch, knowing it was live and unlikely to be shown on the mainstream media. One imagines the police are slightly baffled by the use of video cameras at these events – they must feel somewhat restricted in their actions, knowing they are on film. The cops in San Diego this morning eventually decided the way round this was to arrest the cameraman. Because other media were reportedly not allowed through the police barricades, this put a stop to visual coverage of the event. There have since been unverified Tweets saying the police attacked some protesters and the organisers are to meet later to discuss what to do next.